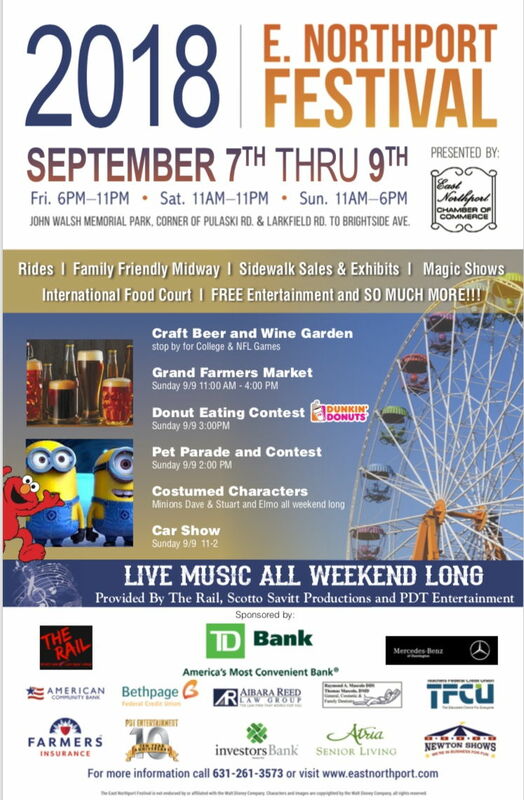 The East Northport Chamber of Commerce’s 23rd annual East Northport Festival is scheduled for Friday, September 7th, through Sunday, Sept 9th, located at John Walsh Memorial Park on Pulaski & Larkfield Rd. 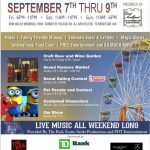 The weekend long festival will have free entertainment and live music, carnival rides, sidewalk sales and vendors, games, delicious food, craft beer & wine garden, and much more. On Sunday, the festival will feature a car show from 11am-2pm followed by the Pet Parade at 2pm, and Donut Eating Contest at 3pm. Pay one Price ride wristbands are available at the fair for $30 each. Discounted ride wristbands are on sale at Brown Paper Tickets for $23 each until noon on Sept 7th.